This will be no great insight, particularly since I heard it from the man himself in an interview, but Steven Soderbergh has a distinct preoccupation with the process of various professions. Whether it be something as entertaining as the process of a heist in the Ocean's films, the process of raising your profile in the prostitution game in The Girlfriend Experience, or especially the process of a revolution in Che, Soderbergh loves examining skilled people at work. So it was for that reason (not to mention my delicate stomach in exploring the inner workings of the human body) that I was delighted to discover that his movie about disease outbreak, Contagion, is more about the process of containing and eliminating a deadly virus than about exploiting its effects. Aside from a show-stopping moment for Gwyneth Paltrow and a few people with an awful lot of sweat, Soderbergh restricts his virus' outward damage to some discoloration and scar marks around the mouth. But the societal damage, of course, can be far deeper, from people exploiting widespread fear to others simply acting out of it. Contagion isn't about the panic that results from such an epidemic, but it does frequently acknowledge it, but Soderbergh knows that an empty airport can be as terrifying as a hectic mob. I fear that in doing so, however, many will be turned off by its resulting lack of urgency. 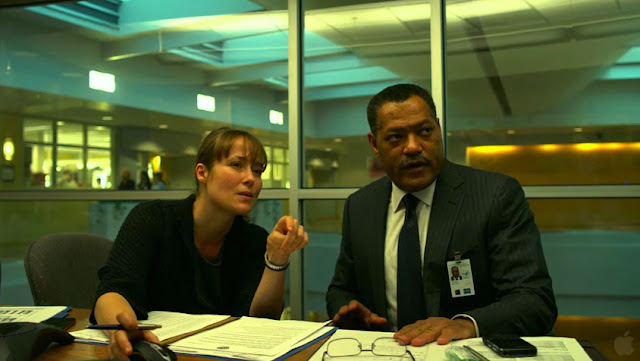 Many of the film's characters - CDC head Dr. Ellis Cheever (Laurence Fishbourne), field doctor Erin Mears (Kate Winslet), researchers Ally (Jennifer Ehle) and David (Demetri Martin) - are the types who deal in this stuff every day. They might not know exactly what they have on their hands, but they know the parameters. Namely, that very little can be known immediately, that it takes a long time to develop a vaccine, that all their research can be thrown out in a single moment as a virus evolves, and that the loss of human life is inevitable. That this whole thing is a process. Thus, after the first act, the film is mostly about people waiting - waiting for clearance, waiting for lab results, waiting for a phone call, their turn in line, anything. It should be boring, but it's not in the least. It helps that Scott Burns' script turns back to Matt Damon's grieving father for a more street-bound perspective, but perhaps I simply share Soderbergh's fascination with watching highly qualified people doing their job. I love the lively banter that neither over-explains nor undercuts, the petty squabbles (I could've spent a whole movie watching Winslet's Erin sparring with the Minnesota government to get even a basic operation going), and the small manipulations of power. Soderbergh has a very casual attitude towards corruption, which shows how innocently such transgressions can occur. Though the film is cloaked in many colors (Soderbergh's palette in his digital era has been decidedly lively), it's the shades of gray that are most fascinating here, which makes it all the more depressing when the film shows such absolute contempt towards Jude Law's blogger character from the start. Other problems abound, but hardly detract from what the film had already achieved. Soderbergh certainly could've used another half-hour - 105 minutes to cover six months of story with at least six people who could be said to be main characters is a pretty thin stretch - and the last scene is a complete waste, especially after the outstanding shot that preceded it. This isn't going to go down as one of his towering works, or even one of the year's best, but it's a very, very good film from someone who knows his craft inside and out. Sometimes businesses with less-than-perfect credit score use money advances to finance their activities. In some instances these advances unit of activity even bought with future credit score cards receipts. the quantity of the money payday loans montgomery enhance depends on the money score rating of a business and its credit score cards sales. among the majority cases, money advances have to be compelled to be compelled to be compelled to be compelled to be compelled to be compelled to be viewed as but of expedient.